What happens when a little bit of warmth creeps in during winter? I channel the spring! I couldn’t help but do some bright color blocking a couple of days ago. This outfit was actually inspired by these earrings. I’ve had them for awhile but was honestly not sure what I wanted to wear them with. They’re so beautiful and colorful so when the weather hit the 50s the other day, I was ready to put them on. Now the 50s might still seem cold, but compared to the 10 degrees we had just a week ago, I needed to take full advantage. 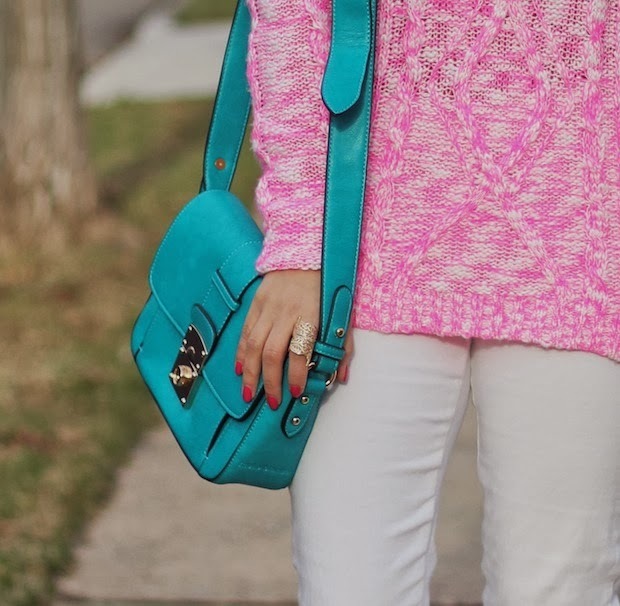 I wanted to play off the pink & turquoise combo so this sweater and bag ended up being the perfect pair. I got this sweater a couple of weeks back and it’s so cozy! Since it has white stitching, I wanted to style it with these white pants. It’s a really simple look with some fun color blocking and accessories. I am definitely anticipating the spring! A few days ago, Aeropostale launched their 7th annual Teens For Jeans Campaign in partnership with DoSomething.org. The campaign encourages young people to donate their gently used denim to teens in need. In the past 6 years, Aero has collected over 3.5 million pairs of jeans. From now through February 16, you can participate by bringing any pair of gently worn jeans to any Aeropostale or P.S. From Aeropostale store. I love brands that give back! Love the bright color pieces with the white pants, your lip color is so cute! Yes it has been sooo cold up north recently that I appreciate when we have weather in the 40s lol. Love the outfit! The sweater is super cute and I love the pop of blue with the bag. I love this spring inspired look! The color of that bag is amazing! Lovely sweater. The colour is so beautiful. Love! I love that the earrings are a focal point in this outfit. Love the look. Omg..!! You look stunning Love , the contrast is amazing , loving your earrings too …, just beautiful …. I've always adored the white-pastels combination, this outfit is perfect!